Game of Thrones fans, join with me in applauding our man Peter Dinklage. 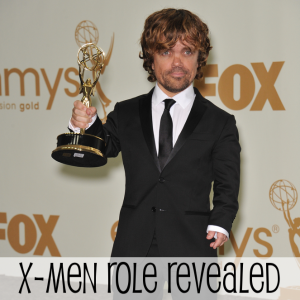 The man who brings Tyrion Lannister to life is joining the cast of X-Men: Days of Future Past as the film’s villain, Bolivar Trask, reports Hypable. The secret was supposed to stay under wraps until the film’s Comic-Con panel this Saturday. Some secrets are just too delicious to keep. Boliver Trask is the creator of the “mutant-hunting Sentinel robots.” He’s an integral part of the film and we know he’ll do a fantastic job with the role of villain. The Comic-Con panel could be releasing footage from the upcoming X-Men film, starring Jennifer Lawrence and James McAvoy. The really cool thing is that we’ll get to see the future characters, including Halle Berry’s Storm and Ellen Page’s Kitty Pryde, overlap with the past, including Nicholas Hoult’s Beast and Jennifer Lawrence’s Mystique. The film is based on the 1981 comic written by Chris Claremont. A dystopian future is ruled by the Sentinels that Dinklage’s character creates. Kitty (Ellen Page) sends her consciousness to the past, along with Wolverine (Hugh Jackman), to warn the X-Men. The past X-Men have to stop a senator that would set the events in motion for the Sentinel’s take over. Hugh Jackman will get stuck in the past and it’s rumored that Anna Paquin as Rogue will also end up hanging with the young mutants. Set photos confirm almost everything but Paquin’s return. We’ll be keeping a close eye on Comic-Con and have full coverage starting Thursday! Get excited.